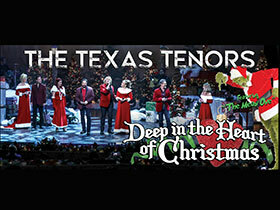 “The Texas Tenors – Deep in the Heart of Christmas,” is a sensational Branson show designed to bring out that feeling of a traditional family Christmas. Everyone loves to hear them any time of year; singing everything from country ballads to opera’s favorite arias, but something about the amazing vocals displayed by “The Texas Tenors,” with that incredible harmony, that sounds extra fabulous during the holidays! Although the foundation of the show delivers a family holiday feel, visual elements and effects, as well as singers, dancers, a real Christmas choir, and delightfully magical characters have been added to appeal to the youngest fans as well as the oldest!